Personally before I begin any stone carving I like to get a feel for the stone and let it suggest to me what design I should carve on it. Sometimes I am bound by requests or designs that are needed. I am lucky most of the time I have the pleasure to let the stone guide my way. Likewise I always tell people to let each carved stone speak to them and allow their minds to be free to interpret the design. There are, however, interpretations, handed down through time, of what powers each animal might have connected to them. Here we will discuss a few of the meanings and the powers that are thought to be attached to the Moose carving. For starters here is a brief outline of the hand carved stone moose’s attributes and powers. With unique and sacred energy moose is wise, headstrong and displays high self-esteem. Moose invites us to explore new depths of awareness within ourselves and our surroundings. Moose helps us to realize our own worthiness, the value of others and reminds us to share our knowledge with all who will listen. To the Algonquin Indians moose was known as the “mong – soa” or twig-eater. To the Athapaskan Indians of Alaska moose was known as Dineega and is believed to have had a close relationship with Raven, whom they thought helped shape the world. The Athapaskan would pray to Raven to assist them in the hunt for Moose. Hence when moose appeared it was a spiritual gift that would come with a unique and sacred energy. The Penobscot Indians of Main believed that moose once was the greatest mammal of the waters, a whale. 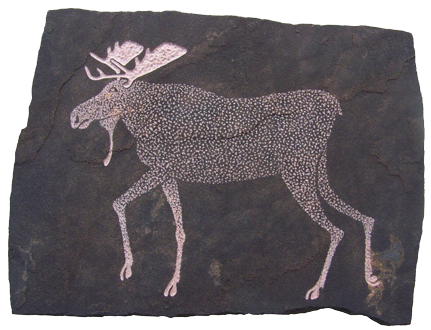 In Nova Scotia the MicMacs used to believe that when moose was hunted too fervently it returned to the sea. Moose was known to have no enemy that cold best it other than the bear and moose’s maneuverability and intuition along with its highly developed senses allow him to outwit bear. All this helps to account for moose’s extremely high self esteem. Moose is known to be assertive, unpredictable, spontaneous and headstrong. Moose is unstoppable and has great longevity. Moose is known to represent values and integrity. When moose becomes a part of your life there may be a void awakened that you weren’t even aware of. Moose is our invitation to explore new depths of awareness and sensitivity within yourself and your environment. As I said previously I like to get the feel of each stone before I begin to carve and allow the true nature of the stone to speak to me to determine what design I carve on it. When carving moose I am always overcome with a great sense of value, integrity and even stubborn headstrongness. I feel compelled to remind you to always let the stone and the design speak through you as each design may mean something a little different to each one of us. Ron White, stone carver and entrepreneur, has been carving stone since 1993 and is shown in more than 40 galleries across the US. Prior to beginning his work with hand carved stone Ron has worked extensively with leather, wood cabinetry and even jewelry. Learn more about Ron White, his work, or purchase your own selection at www.derivedfromnature.com. Or give me a call at 1-800-531-3650. This article was published on Thursday 17 March, 2011.